High temperatures Friday only made it into the low to mid 40's thanks to abundant cloud cover and a stiff North wind. Drier air moving in from the north will help clear the cloud cover away just in time for a beautiful sunset this evening. Over the past week there has been quite the wide range in temperatures. From 80 degrees last Friday, to highs only in the mid 40's a week later. Temperatures will begin to even out as we begin the first of April. Highs over the weekend will warm into the mid and upper 50's, possibly reaching 60 degrees early next week. We had a rainy and cold end to the work week with all that rain that moved through Thursday and the cold temperatures that are lingering today, but the weekend is looking much more positive! A high pressure system will be moving down from the north tonight, which will help to break up the cloudy skies. Because the skies will only be partly cloudy tonight, we are going to see colder overnight temperatures in the low 30°s. However, the high will continue to push those clouds away and give us more sunshine to start the weekend. The increase in sunshine will warm our temperatures into the upper 50°s for Saturday afternoon, allowing for a beautiful start to the weekend. The weekend stays fairly warm in the 50°s, but light rain will be moving in late Sunday night as another low pressure system will pass over our region. The rain will stick with us through Monday, before moving out early Tuesday morning. Even though some more rainy and cloudy weather shows up next week at least the rain doesn't start until late Sunday night, giving us plenty of time to enjoy the weekend! Strong low pressure will pass through central Illinois Thursday night and into northern Indiana by Friday morning. North of the low a steady, and at times heavy, rain has been falling. Temperatures with a strong east wind have been held in the upper 30's and low 40's. South of the warm front temperatures warmed into the 60's with plenty of sunshine. Strong thunderstorms will continue to move east through Indiana and Ohio through the night, with the severe threat shifting further east for Friday. A few additional light showers are possible for the Stateline overnight, but nothing severe is expected. Finally a little break from the moderate to heavy rain that fell most of, if not all of, Thursday morning and early afternoon. A few additional light showers are possible overnight but should not be as heavy as they were earlier. Rainfall totals ranged between one and two inches over northern Illinois and southern Wisconsin. In fact, Rockford broke its previous daily rainfall record Thursday. A total of 1.47" of rain fell between Thursday morning and afternoon. This broke the old daily rainfall record of 0.99 inches set back in 1960. This was also the highest one day rainfall total since January 16th. On that day, 1.01 inches fell. Copious amounts of moisture will be pulled north as low pressure spins out of the central Plains and into the Midwest Wednesday night and Thursday morning. A steady to moderate rain has been falling through much of the evening, but the showers are beginning to lighten up (for now) in a few locations. Temperatures in northern Illinois and southern Wisconsin have been cool with highs in the low to mid 40's, but to the south temperatures warmed into the 60's and 70's. 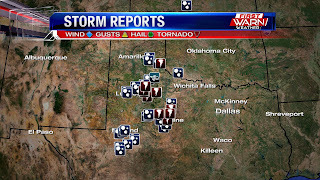 That's where severe weather has been ongoing and will continue through the night. The initial slug of moisture with this first round of rain will continue north into Wisconsin, with additional rain moving in from the thunderstorms to the south. We are not expected to have severe weather, although a clap of thunder or two can't be ruled out overnight. Plan for a soggy commute Thursday morning with steady rain through mid-morning. As drier air is pulled north ahead of the low, the rain should become more widespread and a little more light by Thursday afternoon. As the low passes to the northeast Thursday night and Friday, additional rain showers will be likely into Friday morning. 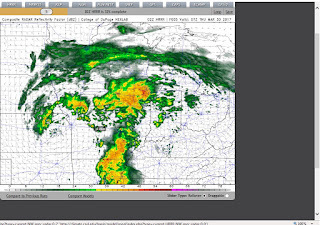 The first image on the left is a simulated radar picture around 2am Thursday morning indicating heavier rainfall over northern Illinois. Rainfall totals will range anywhere from 1-2 inches from Wednesday night through Friday morning. Definitely the highest amount of rainfall in at least over a month. We had a foggy start to our Wednesday, but at least the afternoon will be more calm, with temperatures in the upper 40s and cloudy skies. Winds will start to pick up for the afternoon as that low pressure system continues its approach. Rain is looking to start tonight, but a few counties out west could see some light rain late this afternoon. The rain sticks with us through the overnight and for the entire day tomorrow, before clearing out early Friday morning. Temperatures will also be cooler the next couple of days as a high pressure system up north will continue to channel cooler air into our area, keeping us in the 40s for tomorrow and Friday. However, we'll see warmer temperatures again this weekend as another low will develop in the southwest on Saturday. It will push warmer air into our area for the weekend, and early next week. Temperatures will be in the 50°s this weekend, and the low 60°s on Monday. Incoming low pressure late Wednesday night and Thursday will bring a surplus of moisture into northern Illinois and southern Wisconsin. Initially the moisture will have a little dry air to overcome Wednesday afternoon, but by Wednesday evening light rain will likely be falling. 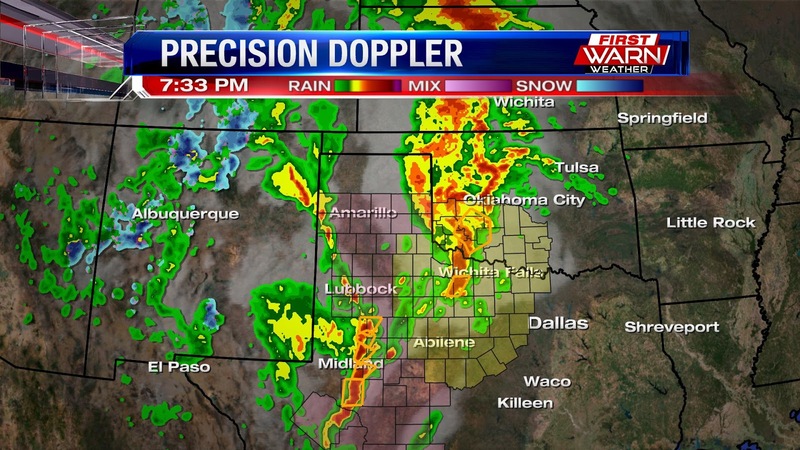 The same low that will bring us a rainy Thursday is also bringing severe weather to parts of Texas Tuesday evening. 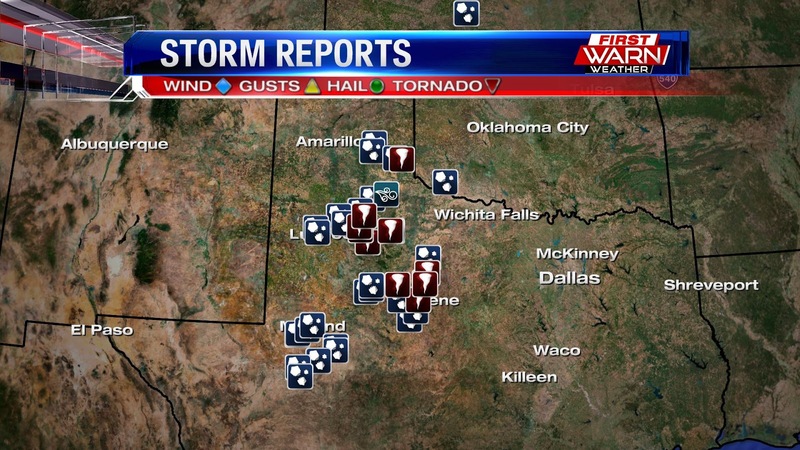 Several reports of tornadoes and hail have occurred with severe weather moving into east Texas Tuesday night. will shift around to the southeast on Wednesday, and then to the east on Thursday. A warm front associated with the low will fall short of northern Illinois, keeping highs in the low to mid 40's during the afternoon. While south of the front temperatures will climb into the 60's and possibly near 70 degrees over southern Illinois. Highs Friday remain in the middle to upper 40's, but we should return to the mid 50's by the start of the weekend. We'll be in the mid 50°s for our afternoon high today, but temperatures will start cooling down quite a bit as we head into tonight. A high pressure system up north is helping to move some clouds out of our area, but it'll pull some colder air into our area for the overnight and the next few days. We'll be in the low 30°s for the overnight tonight, and in the 40°s from Wednesday to Friday. A warm front moves in early Thursday morning, but it won't warm our temperatures very much. It'll bring us rain through early Friday morning, which means we have another cloudy and rainy day ahead on Thursday. The clouds will start to clear a little once the low moves out Friday morning, with high pressure settling in to bring us back our 50° temperatures for this weekend. There have been a wide range of temperatures during the month of March. From high of 80 degrees just this past Friday, to a high of only 26 degrees on the 14th. Temperatures for the last week of the month will be near or slightly below average heading into the weekend. The image on the left highlights forecast highs through next Monday, compared to the daily average highs. It's a little bit of a roller coaster ride, but nothing that isn't normal for this time of year. There are a few days where temperatures remain in the 40's but by the weekend highs should warm back into the upper 50's, if not near 60 degrees. We had a pretty gray and cloudy weekend, and we're looking to get more of that this week. We have a slight chance for rain this afternoon when a low pressure system will bring a warm front fairly close to our area. Even though it won't move into our area, it'll be close enough to allow for some possible rainfall, which is why we have only a slight chance of rain for the afternoon and evening. The low will move east tonight, but it will pull colder air into our area for the overnight. We get a break from the rain Tuesday and Wednesday before another low moves in on Thursday. This low will actually bring the warm front through our area, allowing for rainfall on Thursday and Friday. We cool down for Wednesday and Thursday, but on Friday the warm front will start slowly warming us back up from the upper 30°s that we'll see on Thursday. It'll warm us up to the low 40°s for Friday, and that warmer air will linger in our area as we move into the weekend. As the skies clear for Saturday due to high pressure, the sun will heat the lingering warm air and bring our temperatures back into the 50°s for the weekend. We've had quite a few ups and downs with the temperatures lately. Most notably is what occurred late last week and into the start of the weekend. Highs Thursday reached 49 degrees, 80 degrees on Friday and then 46 degrees on Saturday. What happened?!? It's important to remember that during the transition seasons of spring and fall, we can get fairly large temperature swings. But temperatures that change over 30 degrees from one day to the next don't happened that often. 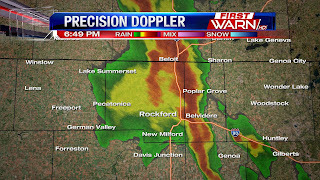 In fact, it's only happened two other times in Rockford since records began back in 1906! Wow! A very strong warm front was responsible for the 31 degree temperature climb from Thursday into Friday. This also came with a gusty southwest wind. Late Friday night a cold front moved south with winds switching around to the northeast. Usually not that big of a deal, but this was a pretty strong cold front. Winds following the front shifted around to the northeast, coming in off of Lake Michigan. Water temperatures this time of year are in upper 30's and can have a big influence on air temperatures, especially for those locations near the lake. Low pressure was also passing to the south not allowing much opportunity to warm due to the persistent northeast wind, cloud cover and periodic rain. Sunday was a little warmer with surface winds shifting around to the southwest. Highs reached the middle and upper 50's. We got a little bit of a break from the rain earlier this afternoon, but it will stay with us as we move through the night. However, much less rain is expected for the overnight tonight as that low pressure system will not be in a good position to pull in a good amount of moisture. The low level jet will keep our temperatures warmer for the overnight, which is a channel of warm air that is most active during the late night hours. This, combined with the heavy cloud cover overnight, will allow our temperatures to be warmer than what we saw during the day today. Heavy cloud cover overnight helps to keep temperatures closer to what was seen during the day, but then you add in the low level jet and you actually see temperatures getting even warmer as you move through the night. Another low is developing in Texas, and will push some moisture into our area tomorrow. This, combined with the low that's already over our area, will increase instability and give us one more round of rain before it moves out late Sunday night. The low in Texas will track south of us, but a weak warm front associated with it will move a small amount of moisture into our area. This gives us a slight of chance for rain Monday evening. After Monday, the weather stays calm for the rest of the week with sunny skies. We cool down slightly for Tuesday and Wednesday, but return to average at the end of the week due to the calm weather. Temperatures are going to be very warm today as we are expected to climb into the mid-70s for our afternoon high. We'll also have partly cloudy skies for the afternoon, giving us a good amount of sunshine to accompany those warm temperatures. The low pressure system to our west has strengthened quite a bit and is pulling warm air into our area at a faster rate. However, the strengthening of that low allows for a chance for thunderstorms to occur in the evening. Showers will occur for the overnight, but the chance for thunderstorms dies down as we head into the night. The rain continues into the weekend, but so do the warm temperatures as we will be in the 60°s this weekend. You'll notice over the next few weeks an increase in farm vehicles on the roads now that the temperatures are beginning to warm. Earlier in the week a truck hit a tractor because the driver of the truck didn't see the tractor at night. We are just under a month away from spring planting and it's important to be on the lookout for farm vehicles on the roads. Be patient and allow extra distance between you and the vehicle in front of you. It can be a little frustrating some times when you get behind one of these vehicles. But just remember they want to get to their destination just as much as you do. Pay special attention at night and when coming over hills in the road. 7:10pm Update: Storms have quickly moved east Thursday evening, even leaving us with a little sunshine back to the west. The remainder of the evening with stay quiet with only a slight chance of additional showers/storms redeveloping late tonight. 6:50pm Update: No active warnings in place, but some of the stronger storms are capable of producing nickel sized hail. 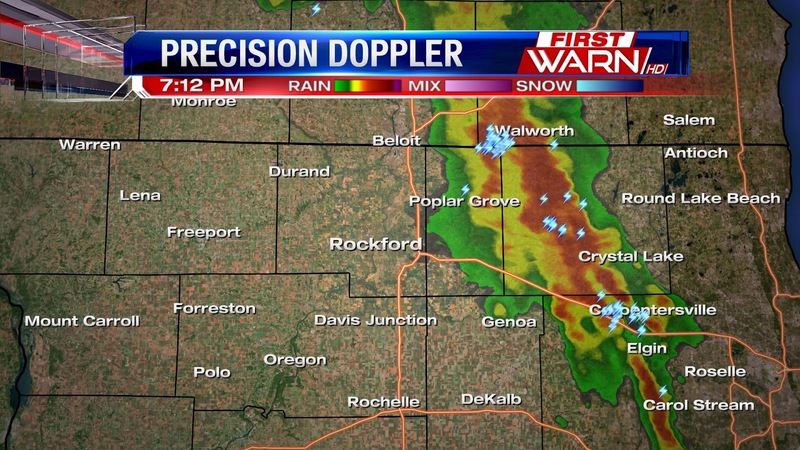 I have received many reports of pea sized hail with the storm that just moved through Winnebago County. So heads up for folks in Boone County. 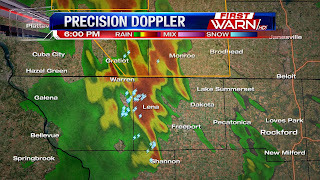 These are fast moving storms and we should be mostly clear by 9pm/10pm. 6:00pm Update: Strong thunderstorm over western Stephenson County could produce half inch sized hail. 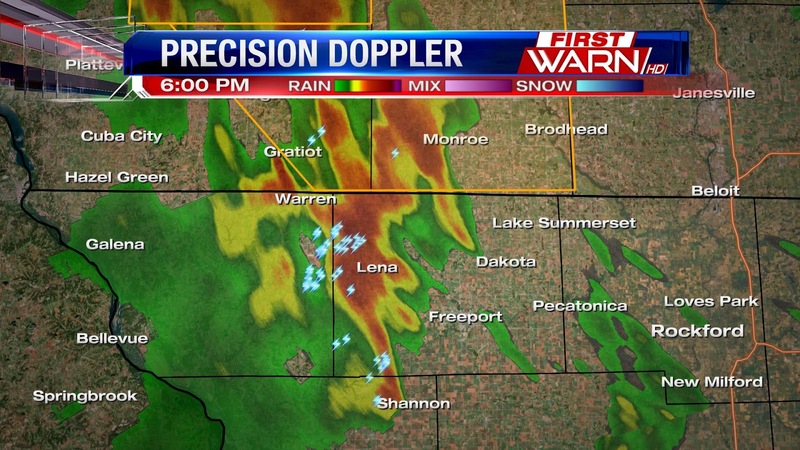 This storm is moving east at 55 mph. Cities impacted are Warren, Cederville, Davis, Dakota, Winslow, Rock City and Orangeville. 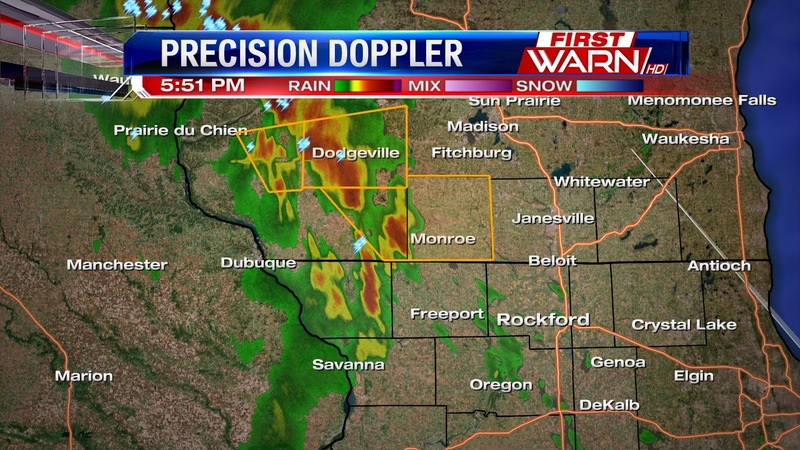 A Severe Thunderstorm Warning has been issued for Green County in southern Wisconsin until 6:30pm. This storm is located near Argyle and moving east at 50 mph. 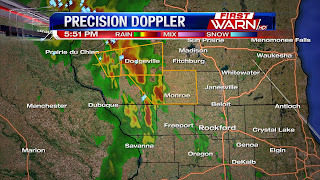 Cities in the path of the storm include: Monroe, Brodhead, Darlington, Belleville, New Glarus, Monticello and Juda. The biggest threat with any storms that move through will be quarter sized (or larger) hail. Move indoors and stay away from windows until this storm has passed. Temperatures will start warming up drastically as we head into tomorrow, with highs looking to be in the upper 60°s. This is due to a low pressure system out to our west, which is pushing warm air and moisture into our area. This process will continue as we head into the weekend, but this will also increase our chances for rain as well. We have a small chance for rain tonight due to a weak warm front that will move through, but the main thing that the front will do is keep our temperatures fairly warm for the overnight in the low 40°s. The low will strengthen during the day tomorrow, which will increase our chances for rain in the overnight. We could even see some thunderstorms in the evening due to the low strengthening. The rain chances taper off as we head into the weekend, with the majority of the rain being seen Friday night. The rain chances diminish Sunday night, but those warm temperatures stay with us for the whole weekend, before we slightly cool to the 50°s to start the work week. A low pressure system out west is strengthening and moving towards our area, which is why we will have mostly cloudy skies for the overnight. As the low approaches our temperatures will gradually warm up as we head into the weekend, with highs expected to be in the 60°s. However, as the low approaches it will bring a warm front through our area Thursday night. The front will be weak Thursday night, but we can't rule out a light rainfall. The front will strengthen into Friday, which is what will help push our temperatures into the upper 60°s for the high Friday afternoon. As the front strengthens it will increase our chances for rain as we move into the weekend. The rain is expected to move in Friday night and will stay with us until late Sunday night. However, the warm temperatures stay with us into early next week. The wave train of storm systems is set to increase heading into the weekend and through the last week of March. will be quick to move in early next week with another following later in the week. With a nearly every other day rain threat, precipitation could be running on the higher end giving us a high probability of above average precipitation through the end of the month. This may even carry over into the first few days of April. will either be right around or above average. Average highs through the end of the month are in the upper 40's to right around 50 degrees. Chief Meteorologist Candice King talked in the previous post about a closed low pressure system that will detach from the jet stream and meander through Illinois this weekend. This will bring somewhat gloomy conditions with mild temperatures, however, it has the potential to bring quite a bit of rain. Ahead of the low, moisture will be drawn in from the Pacific, but also from the Gulf of Mexico. With higher levels of moisture to work with, soggy conditions are looking more likely. Right now the timing of the rain will be later Friday afternoon, with storms also possible. Rain would continue through the overnight and into Saturday morning. Models then take the low through Illinois, and with no support from the upper levels of the atmosphere, it will take it's time moving through. 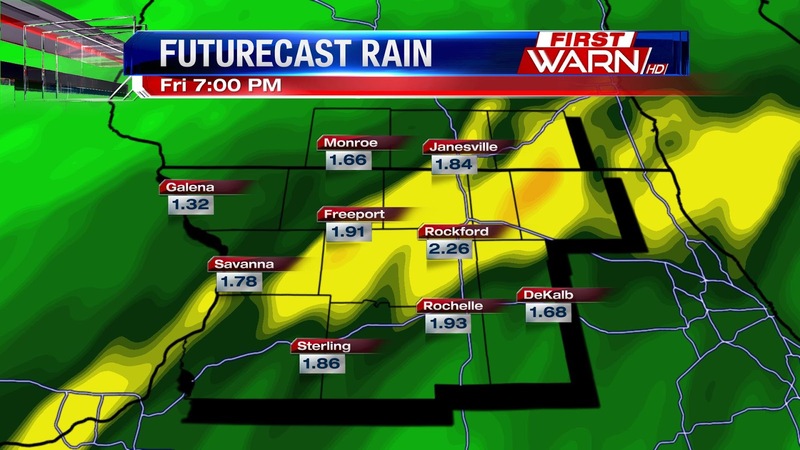 It's possible that some areas close by, near Green Bay, could receive almost 2" of rain. In and around the Stateline, the Weather Prediction Center outlooks anywhere between .75" to 1.25" of rain between Friday and Sunday. The track and strength of the low will dictate how much rain we get, so we will make sure to keep you updated as we get closer to the weekend! The first day of spring did not disappoint! Even though a cold front moved through, temperatures were still able to climb into the low to mid 60's - nearly 20 degrees above average. There will be a brief dip in the temperature the next couple of days as a cold high pressure system moves over the eastern Great Lakes Tuesday and Wednesday. This will cause temperatures to fall back into the 40's on Tuesday, but still above average, and then right around 40 degrees on Wednesday. By the end of the week southerly winds will give temperatures another boost into the 60's Friday afternoon. But an approaching low pressure system from the west will bring a chance for rain and thunderstorms by Friday evening and the weekend. This low will get cut-off from the main flow of the northern branch of the jet stream. With nothing significant in the atmosphere to give it a push, the low will meander through Illinois Saturday and Sunday. There isn't a lot of cold air associated with this low, but there is quite a bit of moisture. This will lead to cloudy, and possibly rainy, skies through the weekend. And if the low stays far enough to the south our surface winds will be from the east keeping temperatures a bit cooler than the forecast high of the low 50's for Saturday and Sunday. Strong southerly winds Sunday gave temperatures almost a ten degree boost over Saturday's high. Incoming cloud cover and a south wind will keep overnight lows in the 40's Sunday with highs warming back into the 50's Monday. An approaching warm front from the south will fall short of reaching northern Illinois and southern Wisconsin. 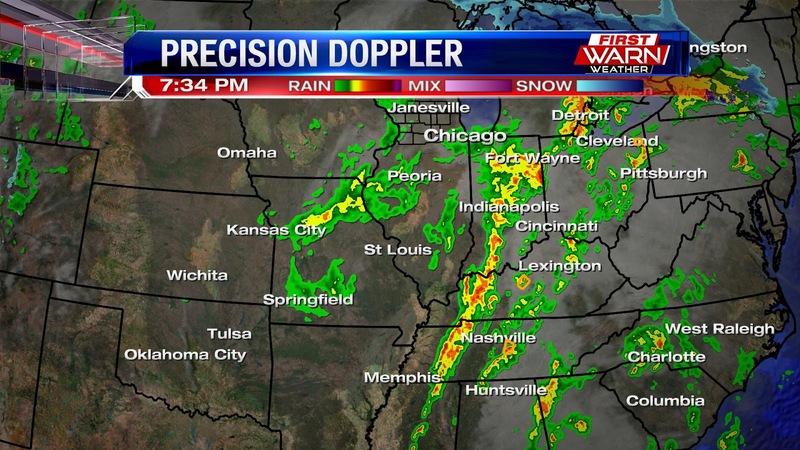 Already this front had been the focus for thunderstorms over central Missouri Sunday afternoon. As the front begins to shift north, instability and moisture will increase and lift north with it. 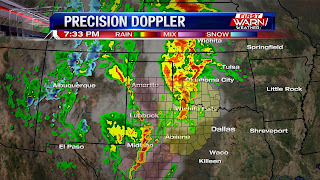 Strong winds within the lower level of the atmosphere will increase and interact with the increase in moisture. This will likely cause thunderstorms to develop over central or northern Iowa late Sunday evening, likely after 10pm. 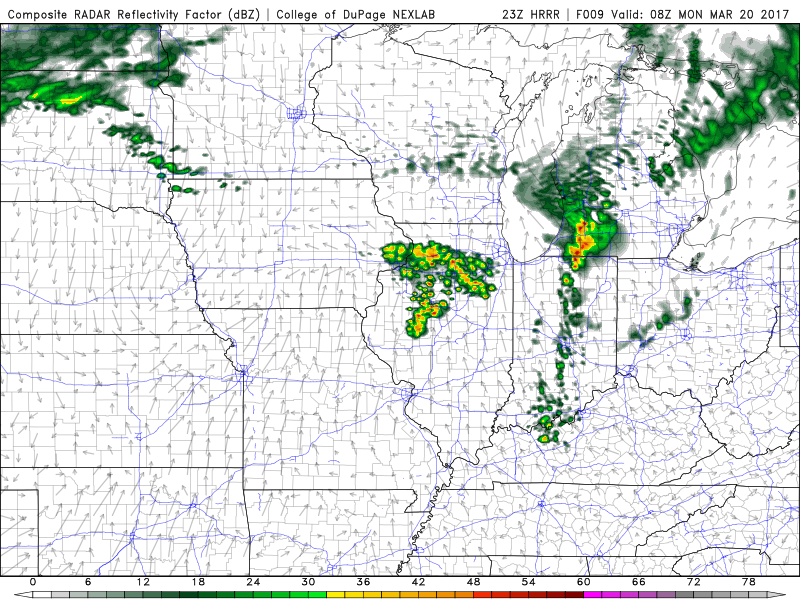 Those storms are then expected to move east into Illinois after midnight. 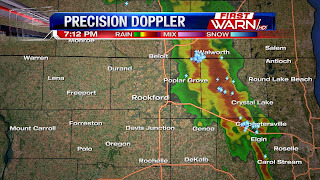 These storms will be elevated and could produce marginally severe hail. 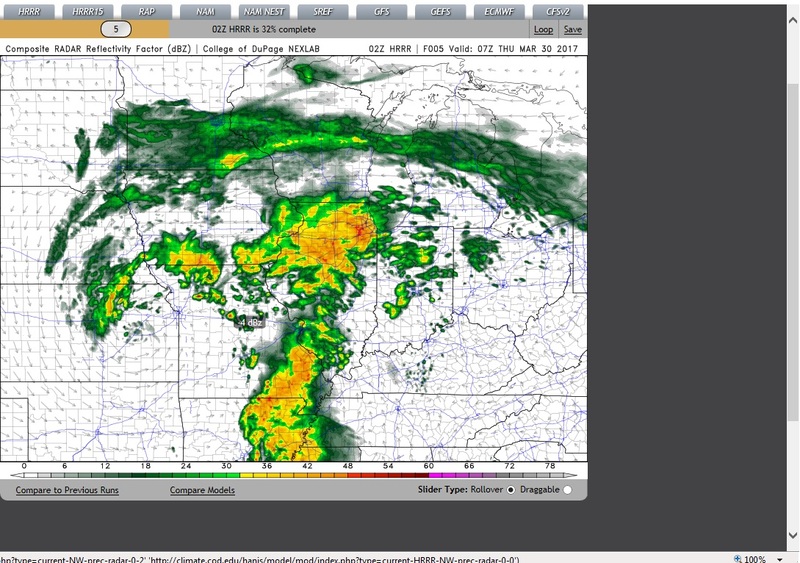 The image on the left is a simulated radar image around 2am. 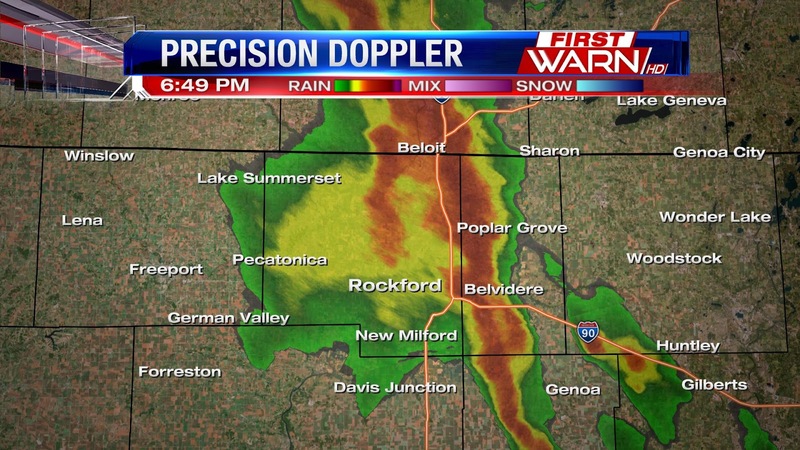 Most short term forecast models suggest the bulk of storm activity staying south of Rockford. Most of the thunderstorms will be southeast of the Stateline by Monday morning, but an approaching cold front could help redevelop a few showers/storms mid-morning Monday to the southeast of Rockford. Spring is right around the corner with the solstice coming up on Tuesday. We've been seeing some spring-like weather the past couple of weeks, with warm temperatures and some strong thunderstorms. We'll be seeing more of those warm temperatures as we progress through the weekend as a high pressure system will move through our area tonight. It will cool our temperatures for the overnight, but warm us up as we move into Sunday with temperatures in the low 50°s. A warm front will move in Sunday evening and bring us some light rain for the overnight, but the front will also keep our temperatures warm as we head into the work week. We'll be in the upper 50°s on Monday and the low 50°s on Tuesday, before cooling to the 40°s for Wednesday and Thursday. Some light rain will move through for the overnight Thursday night followed by some thunderstorms on Friday, where temperatures will warm back up in the low 60°s. For the past month we've been going on quite the roller coaster ride as temperatures have been all over the place. This has lead to a large variability in our weather with severe thunderstorms one day, followed by snow the next, and then repeating the cycle. This week was fairly cold, but another hill comes up on the roller coaster as we climb up into the 50°s for the end of the weekend and early next week. Warm air will start filtering in Sunday morning with a warm front moving through at night. The front will keep our temperatures warm for the overnight, but it will also bring some light rain with it. The accumulation will be small and it will only be a light rainfall. The rain moves out Monday morning where temperatures will climb to the mid 50°s for the afternoon. We slightly cool down Tuesday and Wednesday into the 40°s, but warm right back up at the end of the week with another chance of rain on Thursday and Friday. Yesterday the Climate Prediction Center issued it Seasonal outlook for April, May, and June. If you are a fan of warmer weather then you will like this outlook. They indicate most of the country with a probability of above average temperatures predicted. For the Stateline, that probability is anywhere between about 40-50%. The Climate Prediction Center uses a variety of tools to determine this outlook, including drought conditions, the status of ENSO (El Nino Southern Oscillation), and various other products. An approaching warm front Thursday night will bring a very light wintry mix to southern Wisconsin and northern Illinois. Accumulations are not expected, but the wintry mix could cause roads in southern Wisconsin to become a little slick overnight. Surface temperatures are slowly falling towards freezing and this could cause a brief period of freezing rain over southeast Wisconsin. Once the warm front passes, temperatures will warm a few degrees into Friday morning. This will cause any wintry weather to transition over to light rain and drizzle Friday morning. 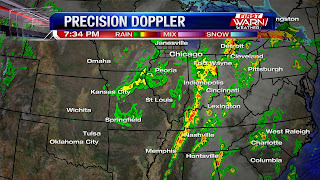 The precipitation will end with the passage of a cold front mid-day. Clouds may stick around through the afternoon, but most of the afternoon should remain dry. Temperatures will warm into the middle 40's. As Meteorologist Kristin Cwynar mentioned in the previous post, temperatures the past few days have been falling short of average. Highs Wednesday reached the low 30's, still about 10 to 15 degrees below average but warmer than Tuesday. Temperatures will continue to warm through the week with highs back to, and slightly above, average by the weekend. But the 6-10 day and 8-14 day outlook from the Climate Prediction Center suggest temperatures over the Midwest, Great Lakes and Northeast may have a higher probability of staying slightly below average. A different end to the month of March than what happened at the end of January and February. While signs of a major cool down (like the one we had Tuesday and Wednesday) are not on the horizon, high temperatures may continue to remain just a few degrees below normal through the end of the month. Normally we should be in the middle and upper 40's. A fairly progressive jet stream will remain in place over the United States making it difficult for blocking patterns to develop, which is what brings the extreme warmth or extreme cold. This fast moving jet stream will also increase the chance for Pacific storm systems to traverse the country, bringing an above average chance for precipitation. Winter made its comeback this week, with record breaking snow recorded on Monday and frigid morning temperatures. The past five days have been anywhere between 10°-20° degrees below average. The coldest was Tuesday where highs only climbed to 26º, compared to it's average of 46°. Today will be one more day with a winter-like chill, the forecast high of 29° is 17° colder then the average. An incoming warm front will bring temperatures near 40° by Thursday, and then into the low 50's by Friday. The warmth comes with some rain, Thursday night into Friday, though right now it doesn't look like it will amount to much. The snow Monday wasn't much, but it was the highest amount of snow we've had since the middle of December 2016! Officially 3.6" of snow came down from midnight to midnight Monday, breaking the previous daily snowfall record of 2.6" set back in 1972. On average, March received just under 5 inches of snow. So far this month we've received just over 5 inches of snow. No snow is in the forecast this week - just a little rain before the weekend. Most totals were between 2-5" across the area, but just north of the Stateline in Elmwood Park which is in Racine county in Wisconsin, 8.8" fell! Snow will stay rather light through the rest of the afternoon. So far across the Stateline about 2 inches has accumulated, but residents can expect an additional two inches over the next couple of hours. The highest totals have been found just west of the Stateline, with many cities in Iowa receiving 4-8 inches. Per IDOT, US 20 west of Rockford through Freeport and to Galena is snow covered. I90 from Rockford to Chicago is rather clear, along with I90 and 39 north of Rockford. Side streets and country roads will continue to cause some problems through the morning an afternoon. Make sure to leave plenty of time to stop, and it will be hard to get going again..
Our far eastern counties could get clipped by lake effect snow that will develop this afternoon, as northeast winds off the lake will help to produce enough instability to support it. Snow is starting to lighten west of Rockford from Freeport to Galena as the low pressure system shifts to the south and east through southern Illinois. Because of this track, heavier snow has been falling through central portions of the state as well. Snow will continue to wind down through the lunch time hour with snow totals climbing to about 4" for many with some areas receiving around 3" and as high as potentially 6". The current forecast though is around 4" for the majority of the area. A Winter Weather Advisory has been issued for all of northern Illinois and southern Wisconsin beginning Sunday evening and lasting through Monday evening. The air mass over the Stateline is pretty dry with dew points in the low single digits. But those dew points should quickly rise allowing the snow to reach the surface after 8pm. The snow will begin light and then pick up in intensity during the overnight and early Monday morning. Highest impact to travel will occur late Sunday night into Monday morning. So please allow for extra time during the morning commute. As the snowfall rate increases, roads will become snow covered and slick with road surface temperatures falling below freezing allowing the snow to accumulate. Most of the accumulating snow will be done before Noon Monday, with only a few flurries expected during the remainder of the afternoon and evening. Snowfall totals by Monday morning should be between 3" and 4", with another inch or two accumulating during the day Monday. Overall 3" to 6" of snow should occur for northern Illinois and southern Wisconsin. Winds will increase Monday, but blowing and drifting snow shouldn't be a major issue. 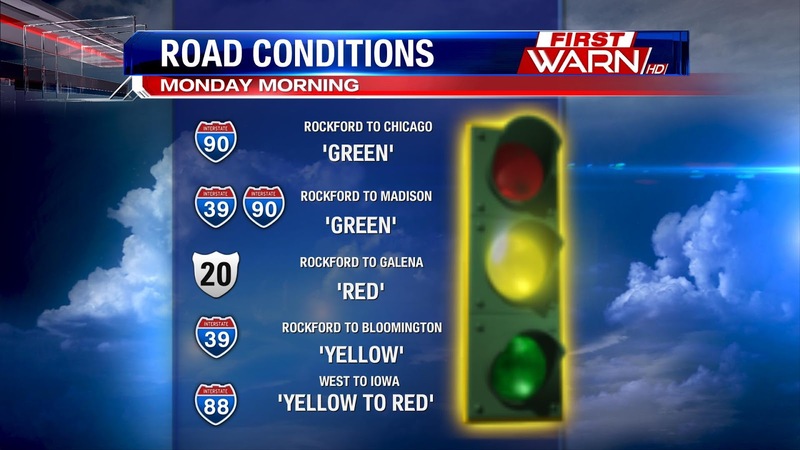 Road conditions will remain slick through Monday evening. A high pressure system up north will continue filtering cold air into our area and clear the skies for the overnight, which is why we will be seeing colder temperatures for our overnight. We will dip down into the low teens for our overnight temperatures, before moving into the mid 30°s for tomorrow afternoon. A low pressure system out west is strengthening and will be moving to our area tomorrow evening. It'll bring a warm front through our area, which will start the snow showers between 6 and 7pm. The snow will stick with us until Monday night, where we are expecting a total accumulation of 3-5." We get a short break from the snow before it returns on Thursday and Friday. The accumulation combined for both of these days will be between 1-1.5," much smaller than what we're looking to get Sunday evening to Monday night. Along with getting two shots of snow next week, we'll have temperatures in the 20°s and 30°s. Winter weather is looking to make quite a comeback!